One of the best things about this comic has been the sense of desperation and the resulting horror. The highlight of the first issue was a zombified Hot Dog attacking Jughead. In the second issue we saw Jughead attacking Mr. Weatherbee and Ethel. In and around all of this, we’ve seen how Riverdale slowly but surely falls to the zombie apocalypse as the plague spreads throughout this small town. When we begin this issue, some of the latest victims are Jughead’s father and Riverdale’s most famous fast food restaurant owner Pop’s. As a big fan of the characters and setting for ages, I can’t quite contain my own horror at seeing these characters get twisted into these parodies, or falling victim to them. And this is why Roberto Aguirre-Sacasa and Francesco Francavilla succeed so well with this series, because they are not pulling their punches and are plowing on full throttle. Each issue presents a new horror, initially couched in the context of innocence and the loss of that innocence. Issue #3 certainly exemplifies that, most notably when it comes to two of my favourite characters, Moose and Midge. The thing is that whenever I pick up an issue of Afterlife Witch Archie, I feel sad at what is happening to my favourite characters. I connect with so many of them. This just shows how good the writing on this series is, and how good the art is, that the visualisation makes it all the more surreal. In this issue, one of the more interesting things we see is some backstory on Hiram Lodge, Veronica’s father and someone who disapproves of Archie very strongly. This issue shows us his earliest days in Riverdale, as he comes into the town in a bid to relocate Lodge Industries and reestablish himself and his family here, especially since his wife Hermione is pregnant with their child and he wants to create a new life for himself. Of course, this ends up feeding back into the ongoing story and we see how strongly Hiram feels about the kids under his protection, now that the survivors of the party at the school have taken refuge at Lodge Manor. It does a lot to help me connect with him. And his butler Withers is delightful as always. One of the more remarkable moments in the issue is when Betty kind of asks Archie straight up who he likes more: her or Veronica. Archie’s reply, for me, is very poignant and fits his personality to a T: “I’ll be waffling for the next seventy years”. That has been a central theme of the Archie comics for years and Archie has always been caught in a tug-of-war between the two girls. I don’t know, I kind of liked that moment. This becomes more significant later on when Betty and Veronica have a girls moment and despite their differences they kind of come together to be there for each other like good friends. And for the art, well, Francesco Francavilla’s art is too good for mere words to describe. His characters’ expressions were all top-notch this time and all the scenes he does with the infected people were really good once again again. I wish I could get posters made out of every page! Overall, a damn awesome issue. More Afterlife With Archie: #1, #2. Posted on January 13, 2014, in Comics Reviews, Review Central and tagged Afterlife With Archie, Archie, Archie Comics, Comics, Comics Review, Francesco Francavilla, Horror, Jughead, magic, Review, Review Central, Riverdale, Roberto Aguirre-Sacasa, Suspense, Urban Adventure, Urban Horror, Veronica Lodge, Witches, Zombie Apocalypse, Zombies. Bookmark the permalink. 8 Comments. I picked up issue one of this series only because my LCS was one of the shops picked to be highlighted on the variant cover. Lo and behold, after reading it, I was shocked to find out that I loved the damn thing. I hadn’t read an Archie comic since I was a wee little kid. But damn, do I love this series. Great write-up on the whole thing. 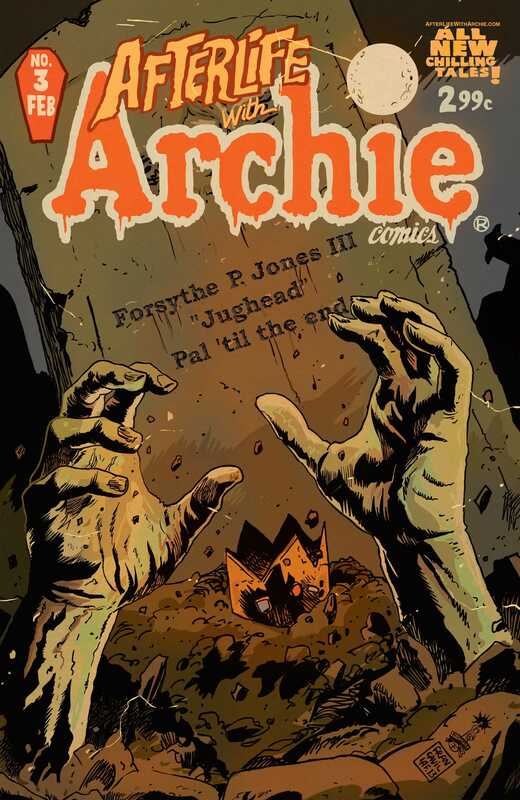 I love Archie Comics and that’s why I was apprehensive about Afterlife With Archie. It’s so different that I was afraid it wouldn’t respect the history of Archie. Thankfully I was wrong about that. It certainly does and adds to it as well. Great comic! I’m glad to see it’s selling well and hopefully bringing in people who had never read Archie. I hope they explore Archie’s past and find the same treasures other Archie fans have found. As a matter of fact, I do plan on checking out some other Archie stories. Any suggestions on where to start? Sadly no. These are the only “new” Archie comics I’ve read in ages. I have 2013’s FCBD issue of the digest, but that’s about it.